The journey of a thousand miles began with my first step – right into the front door of the Barren County YMCA, an outpost of fitness in my rural agricultural town in southern Kentucky, circa 1998. “Ma’am, do you teach Pilates here?” I inquired. 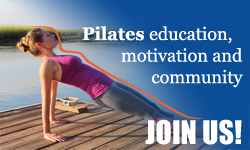 “What in the world is Pilates?” The girl behind the welcome desk furrowed her brow at me. Yes, I was in the Pilates wilderness. The nascent, dial-up internet proffered a potential relief to my unrelenting pain and I was hell-bent on finding Pilates somewhere, somehow. I had danced and taught fitness classes, so I believed in movement’s power to heal. Except now I couldn’t move. Neither rest nor physical therapy had helped – my self-fused lumbar vertebrae were pressing on a nerve. I could no longer perform my sales job well, carrying heavy trays of orthopedic hardware into hospitals in high heels and a tight skirt. I could no longer lift my toddler. Hell, I couldn’t even walk upright. Living on NSAIDs, I had to seek my own answer since Western medicine had offered me none. I began my journey with Brooke Siler’s seminal book, “The Pilates Body.” With just a little bit of practice my pain abated. I really couldn’t believe it but yet I could. I knew the human skeleton intimately – I’d seen it up close when I assisted in orthopedic surgeries – the surgeons had to filet layers upon layers of tissue, fascia, nerves and muscle for hours to uncover the spinal vertebrae. I had a glimmer of understanding that muscles might be the key to unloading my compressed discs and nerves. One weekend training later I was teaching mat classes at that same little YMCA. The room was jammed – I was on to something. My back pain was a common dilemma. Realizing I needed more training, I searched the internet again for a more comprehensive program. Of course I barely knew what a reformer was let alone the difference in Pilates schools and requirements. I fell upon Polestar, and a friendly young man effusively described the program then signed me up for their modules. And that’s when I fell in love. Polestar sent the beautiful and talented Kristen Veltkamp to Louisville to train a small group of enthusiastic trainees, and as soon as she put her hands on me I was hooked. Her warm generosity, skill and open heart helped heal my back and brought me into the Pilates fold. The program was PT-based and complicated for a neophyte – we learned details like the degrees of motion within each joint and how to perform and chart an intake movement screen. It didn’t provide a consistent framework , it was rife with hundreds of modifications and specific reasons for each, but it was Pilates and it was wonderful. I happily graduated and went out to teach at my own studio, Carriage House Pilates, in Glasgow, Kentucky and in Kathy Perry’s studio, Absolutely Pilates, in nearby Bowling Green. We were busy and excited, teaching small equipment and mat classes and privates. It was a heady time full of success but after about two years I realized our clients were plateauing out. They had built new strength but not enough, in my opinion. So we sought answers by going to conferences, learning new modalities – barre, yoga, M.A.T., PNF stretching, and safe-back protocols with Rebecca Leone and Eve Gentry’s work with Michele Larsson but it wasn’t until a handsome, brilliant and generous Romana-trained teacher joined us that we understood the rest of the puzzle. Kirk Smith conducted weekly in-house teacher seminars on the classical method for us. I will never forget his admonishment that you had to “earn” the boomerang. Despite our teacher status, he would not let us rock into each position but forced us to go back and learn each shape within the exercise. What a revelation this was. My body had to relearn the basics and as humbling as that was, I realized I was developing the strength that I intuitively knew I needed. But it wasn’t until 2016 that I discovered the mentor I needed. I took a scoliosis client to be evaluated by Nashville-based Sonjé Mayo, a brilliant Pilates master who is trained in PT and the Schroth technique. Not only was she the most professional teacher I had ever met, she was one of the most eager to help. And she moved like a cat. While my client got an amazing home exercise program, I signed on to her weekly mat classes and an ensuing weekly private. The first week she trained me I nearly died. She found every stiff joint and flaccid muscle I didn’t know I had. Her teutonic demeanor demanded perfection and I wanted to give it to her. With every atom of my body. But it was like I had to run a marathon without training for it! As I paid her that first day she put her arm around me and asked, “are you going to be able to drive home?” Humiliated and inspired, I drove back to southern Kentucky in awe of this woman. I now eagerly make that weekly sojourn. After rising at 5 am for a 6 am private, I drive the 90 miles to train with her for two hours, jump back into my car and return to finish the day out teaching in my carriage house studio. A year and a half later, I am a Classical Pilates convert, with the strength to show for it. Sonjé has guided me carefully and slowly to become a better teacher and practitioner. She studied under Joseph Pilates himself when she was a young dancer, travelling to New York City from South Africa. She was at the beginning of her career and he was the end of his, and his influence permeates everything she does. She is as demanding and insistent at he was – she can make a grown-woman cry – but she breeds extraordinary loyalty and exquisite teachers. And her clients, many middle-aged and injured, are the strongest students I have ever seen! And now mine are too. I am able to articulate the method so much better, and they have gained more ability and have really lengthened out and changed their bodies. Many have become pain-free. One client, a middle-aged chiropractor, finished his lesson on the Cadillac and he jumped off and then jumped high into the air. He shocked both of us and he turned to me incredulously and asked, “how did I do that?” We both burst out laughing. He felt the magic of being totally connected! He is now the strongest person in his rock band, even though the other members are half his age. In many ways I feel as if I’m starting over again, but I wouldn’t change my path. I have met extraordinary women and men on this journey, one that Sunni Almond has so brilliantly dubbed “Going More Joe.” I have evolved from my cerebral approach to teaching Pilates to a more kinesthetic, intuitive and professional technique. But I now have a new and equally daunting challenge – Sonjé is sending my to the Red Thread Ranch, to meet and study with the legendary Kathi Ross-Nash. Am I scared and humbled all over again – you bet. Am I excited and thrilled and up for the challenge? Pamela Lessenberry, a Canadian-American, graduated with honours from the University of King’s College in Halifax, Nova Scotia with a journalism degree. After working in broadcast and print in Charlottetown, Prince Edward Island and Cleveland, she backpacked across Europe, considering it the best graduate school extent. She returned to North America to become a consultant for an orthopaedic implant company in Louisville. Pamela eventually settled down in rural Southern Kentucky, where she opened Carriage House Pilates in 2006. Surprised by her overwhelming success in helping people get out of pain and restore function and vitality, she is now dedicated to becoming as well-trained as possible in the Classical Method.